With summer fast approaching it’s time to give a little routine maintenance to your backyard. Over 50% of homeowners upgrading their outdoor space spend six or more hours relaxing, entertaining, and gardening there per week. Backyards are the epitome of summer fun for children especially and so it’s important to guarantee their safety. The following tips will provide you with ways to keep your backyard kid-friendly while also guaranteeing you the aesthetic appeal you love about a summer yard. Trampolines take up a lot of room and can make your backyard look far smaller than it really is. They can also be incredibly dangerous. In a study, the Pediatric Orthopaedic Society of North America found more than a million cases of emergency room visits were caused by injuries related to trampoline use. Grilling can be boring if you’re too separated from the social area, but it can also be dangerous for kids to be too close. Designate a specific part of your deck or outdoor space for grilling purposes so you’re not too far away from the fun, but also keeping the kids away from the heat by establishing a safe space. Use a cable handrail systemIt’s essential for decks higher than a couple of inches off the ground to have some kind of railing system. The installation of a cable deck wire railing will protect children as well as adults from falling and causing potential injury. A cable rail is nearly invisible in contrast to a wooden rail and therefore keeps your kids safe without obstructing the view of your backyard to other neighbors and family members. 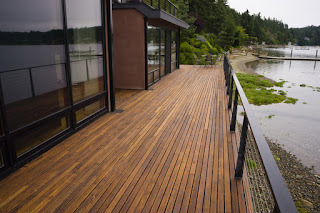 A cable handrail system also creates a more modern look to your back deck. You can also choose from a variety of frames for your cable deck railing depending on your aesthetic appeal including stainless steel, wood, or aluminum. Regardless of the changes you make to create a more kid-friendly backyard, it’s important to supervise your children at all times. Supervising your kids will keep them safe from any potentially dangerous situations such as drowning or falling from trees or other backyard equipment. Backyard fun is an essential part of summer. By using these tips to keep your backyard kid-friendly and by supervising your children, you can be sure to have a great time during the long summer months.